Colbert, Maron, Suffering, Faith, and Comedy. Did you ever go through a period where you lost your faith? What caused you to go through that dark period? Well, I had very sad events in my childhood. The death of my father and my brothers was understandably a shattering experience that I hadn’t really dealt with in any way. And there comes a time when you’re psychologically able to do so. I still don’t like talking about it. It still is too fresh. Do you think experiencing that has helped what you do in any way? Or made it more of a challenge? Not to get too deep here, but the most valuable thing I can think of is to be grateful for suffering. That is a sublime feeling, and completely inexplicable and illogical, but no one doesn’t suffer. So the degree to which you can be aware of your own humanity is the degree to which you can accept, with open eyes, your suffering. To be grateful for your suffering is to be grateful for your humanity, because what else are you going to do — say, “No, thanks”? It’s there. “Smile and accept,” said Mother Teresa. And she was talking to people who had it rough. That’s not how you make jokes, though. Strauss, Neil. 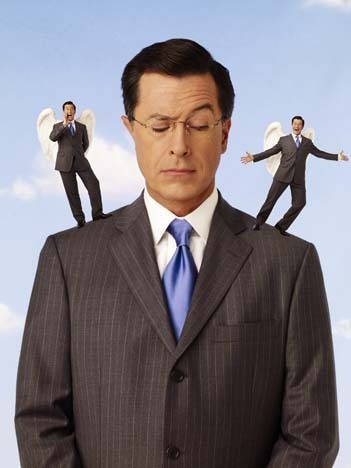 “The Subversive Joy of Stephen Colbert. (Cover story).” Rolling Stone no. 1087 (September 17, 2009): 56-110. Academic Search Premier, EBSCOhost (accessed July 7, 2011). Digital version had not page numbers. Colbert is one of the great comedic minds of our time, and he’s also very thoughtful. His character on The Colbert Report seems very different from the man in this interview, but that’s all part of Colbert’s genius. His thoughts on suffering I think are very important. Particularly when we think about the arc of comedy the U-shaped plot line which follows Good Life, Low point in life, Restoration. That low point in the story is incredibly valuable because it makes the characters more human and more relatable. Suffering is a part of everyone’s life and it becomes increasingly more important to realize that your suffering doesn’t have to be the end of your story. Yesterday I was listening to the WTF podcast with Marc Maron. He gave the Keynote speech at the Montreal Just For Laughs Festival. His speech dealt with the low point of his life: divorced, a career that was dying, and thoughts of suicide. But for him comedy saved his life, and he decided that the his suffering was not the end of his story. He began to take charge of his career, began a podcast where he reached out to other comics and began to process his pain. Having listened to almost every episode (I know I’m a pastor but Jesus has heard cuss words before so I’m not too worried about it) Marc has come to understand who he is, he has examined spiritual issues, and really become a voice for others who are suffering to know that they are not alone. That laughter is the reminder that this moment of despair is temporary. This present suffering does not have to be the end of our story. As a Christian and a Pastor, my purpose is to point people to Jesus. Jesus suffered, just like we suffered. And through the mystery of the incarnation. Jesus, the eternal son of God, because of his suffering understands our suffering. We don’t have to do life alone. We don’t have to suffer alone. We can embrace our suffering, learn from the moment and be transformed. We truly can live a life of comedy even though we might feel like we are living a tragedy. I love 30Rock. Smart, funny, quick. All good things when it comes to a sitcom. Kathy and I were watching it the other day, and I was struck by a really fun idea, how does the Church line up with 30 Rock? Jack has a lot of ideas, but knows that he is not going to be the one to actually carry them out. He’s always thinking about leveraging the organization to the next level through things like “Synergy” and “Stratification.” Jack put in his time and moved up the org chart. He’s got bosses, but he’s definitely king of his empire. For Jack it’s TGS and Mircrowave Programming. Liz works hard and carries a lot of responsibility on her shoulders. Liz is often responsible for making Jack’s ideas happen. She has freedom to disagree with Jack in conversation but she also wants to make sure that their work is great and innovative. Liz wants to move the organization forward, but she is working with people who are all working their own agenda, Liz has to build the habit of bringing all these people back to the same agenda. No one knows what Tracy is going to do, but other people will know that they have to pick up the pieces. Tracy has two guys who Dot Com and Griz who keep him on track. Youth pastors (having been I youth pastor I know) need to have youth leaders to keep them focused as well. The dreamer. The performer. Always working on something crazy on the side. I could probably go a lot deeper in this whole thing. And again, I am not saying this is Creekside, but it’s a pretty stereotypical representation of the Church, based on stories I have heard and seen. The idea tickled me and I had to write it out. Hey here is sunday nights open-mic set. It might be cheesy and hack-y of me to post these videos of myself. But I enjoy them and I assume that everyone else should as well.